Delaware Gov. 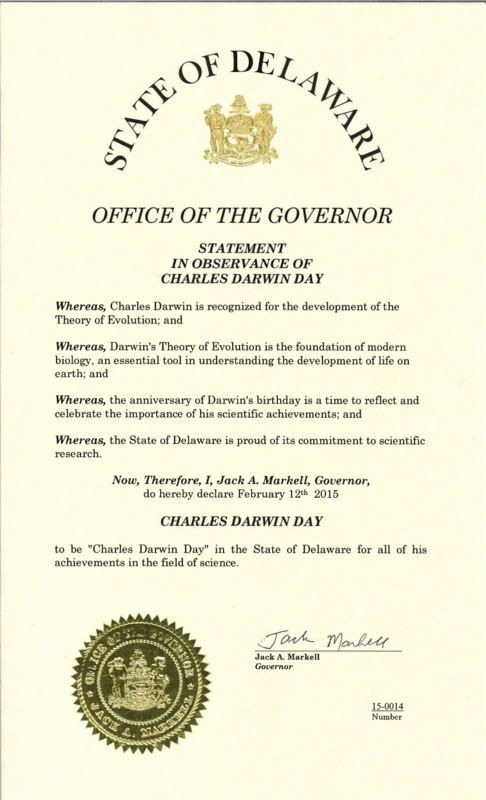 Jack Markell (D) has declared Feb. 12 as "Charles Darwin Day" in the state. Praising Darwin's theory of evolution as "the foundation of modern biology, an essential tool in understanding the development of life on earth," Markell's proclamation says Feb. 12 -- Darwin's birthday -- "is a time to reflect and celebrate the importance of his scientific achievements." Darwin Day has been celebrated by groups in the U.S., Europe and Canada on the British naturalist's birthday since 1980. In 2013 and 2014, then-Rep. Rush Holt (D-N.J.) introduced legislation to designate a national Darwin Day. Despite support from some House Democrats, the proposal never got off the ground. Former Rep. Pete Stark (D-Calif.) made a similar attempt in 2011. A 2013 Pew Research Center poll found that 60 percent of American adults believe that humans and other creatures have evolved over time, while 33 percent reject the theory. A 2014 Gallup poll found that 42 percent of Americans believe humans were created by God in their present form, while about 50 percent said they believe humans evolved. The Pew study also found belief in evolution differs strongly by party affiliation, with 67 percent of Democrats expressing belief in the theory, compared with 43 percent of Republicans. Markell was first elected governor in 2008.